Follow the steps in this example for upgrading DataStax Enterprise (DSE) from version 5.1.0 to 5.1.3 using Lifecycle Manager (LCM). This example clones a configuration profile and runs an upgrade job for a datacenter. 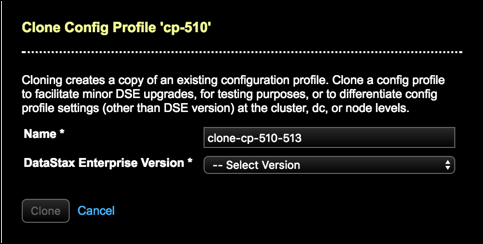 Clone a DSE version 5.1.0 configuration profile to DSE version 5.1.3 from the Config Profiles page. 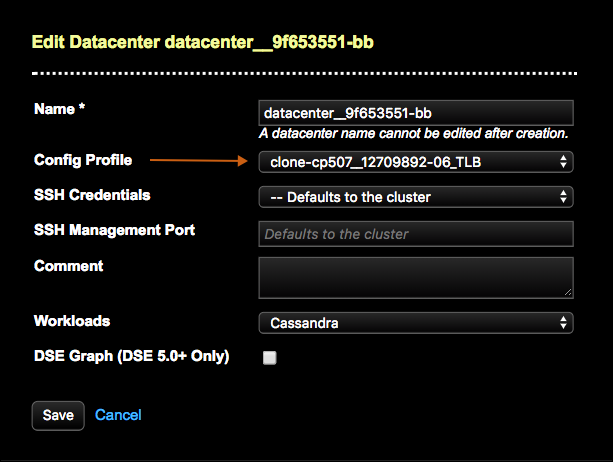 Associate the newly cloned configuration profile with the datacenter in the Clusters page. 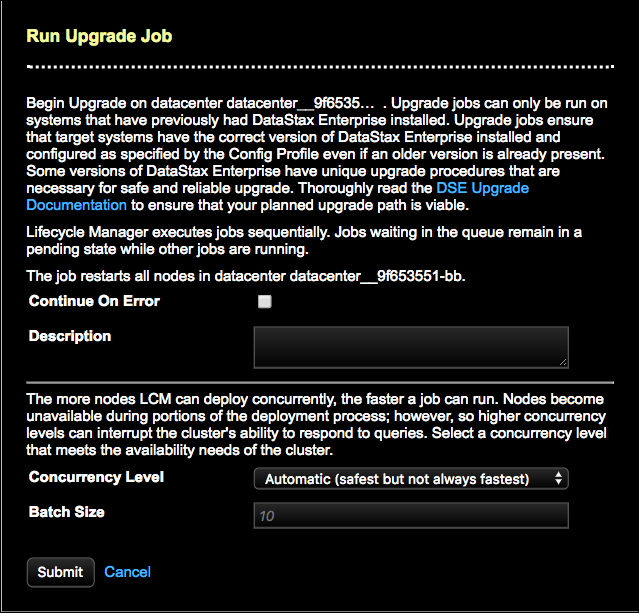 Run an upgrade job for the datacenter from the Clusters page. View the status of the upgrade job in the Jobs pages. This example assumes you have reviewed the DSE upgrade guide and performed any necessary prerequisite steps applicable to the DSE version you have planned to upgrade to. Click the clone icon for the configuration profile you want to clone. 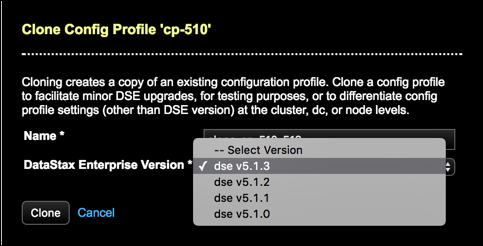 This example selects an existing configuration profile for DSE version 5.1.0. Select an upstream DataStax Enterprise Version to upgrade to. This example selects dse v5.1.3. 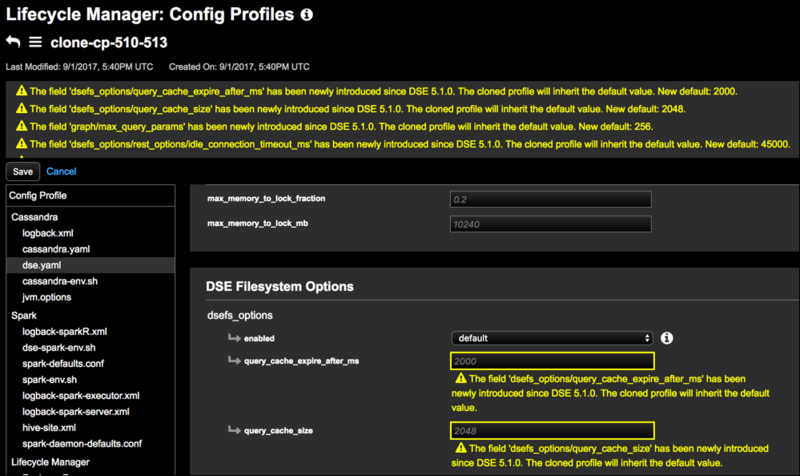 The Config Profiles page displays the notifications for settings that have changed between the DSE versions. Click each profile notification to review it in context within its configuration file. Adjust any settings as appropriate for your environment. This example allows inheritance of all new default values. The cloned configuration profile displays in the list of configuration profiles. Click Clusters in the LCM navigation menu. Select the datacenter to run an upgrade on. This example selects a datacenter that has DSE version 5.1.0 installed and configured. 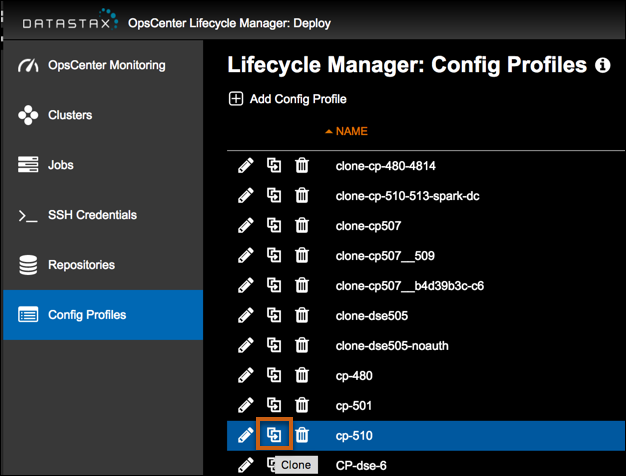 Associate the cloned configuration profile with the datacenter being upgraded. Click the ellipsis icon, select Edit, and choose the configuration profile in the Edit Datacenter dialog to use for the upgrade. Click the ellipsis icon and select Upgrade for the datacenter being upgraded. Review the information in the Run Upgrade Job dialog and click Submit. This example uses all default settings for the upgrade job. Review the status and details of the upgrade job in the Jobs pages.